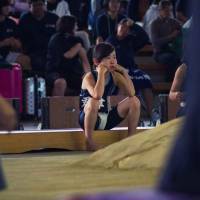 Less than a month after International Women’s Day, sumo found itself embroiled in a gender-discrimination controversy when a female nurse administering CPR was ordered to leave the ring by an official. The sport’s long-standing ban on women entering the ring has periodically come under fire, but the life-and-death circumstances surrounding the recent incident have given the criticism added intensity this time around. As with most issues of equality, the pressure for change has only grown each time it surfaces in the public consciousness. For as long as I’ve been involved in sumo, the ban has made me uncomfortable and I believe it’s time for it to be scrapped. Of course with a move of this significance it’s incumbent upon those calling for change to explain just why it should be made. First of all we have to ask what the purpose of the rule is. Women are not barred from the sport completely. They compete in amateur tournaments and play a large role in the management of professional sumo stables. The proscription is solely Shinto related and can be seen in other places “sacred” to the religion such as on Mount Omine in Nara. It’s essentially an interpretation of that ancient practice that considers women impure and bans them from holy ground. Of course that’s not a view ascribed to by the vast majority of people in this day and age, so why do we keep the rule? The main (only) argument given, is that it is a tradition and as such shouldn’t be changed or forsaken. That ignores the obvious fact that every tradition was new at one time or another and all without exception have undergone change. Some, like human sacrifice, were once intrinsic to the way of life of entire civilizations but died out as humankind moved toward a more enlightened stance. It’s debatable as well just how important this particular tradition is to the Japan Sumo Association. Sixty-one years ago, Takasago stablemaster (former yokozuna Maedayama) had no problem inviting a famous female sumo wrestler into the ring to mark her retirement. Similarly the ring the medic entered this month wasn’t dismantled or repurified afterward as custom dictates, just as it wasn’t in 2007 when a woman climbed up on the one in the Kokugikan in the middle of a tournament. Practicality outweighed tradition, a fact that should come as no surprise to anyone that follows the sport closely. The Sumo Association has changed and adapted many traditions over the years for various reasons. Indeed, when Gov. Fusae Ota of Osaka was protesting not being allowed to make a presentation in 2000, they even polled fans asking if the ban should be scrapped. Hardly something they would do if unwilling to make a change. Even if one is more strident than the JSA itself in maintaining the ban, an “argumentum ad antiquitatem” (appeal to tradition) is a weak defense when the status quo is inherently discriminatory. “Women should not enter the ring.” Replace the subject in that sentence with pretty much any other group of historically persecuted people (blacks/Jews/people with Down syndrome etc.) and see how easily it sits with you. Let’s not forget that in an increasingly post-binary-gender world, such discriminatory policies have a very limited shelf life. Is the JSA’s ban based on biology or gender identity? If it’s the former, will they need to implement testosterone testing as in the Olympics? If the latter, how do they deal with someone who is gender-fluid? What about someone who is transgender? And that’s not even touching on potential questions raised by the rapid development of technology. Is it acceptable for a physical male avatar to enter the ring if piloted by a woman? What about when we develop artificial general intelligence? Will androids have to specify a gender? The more you break it down, the more ridiculous it becomes. The solution is quite clear. Do away with the ban and treat all people fairly and with equal respect. Sumo may not actively promote itself as the national sport, but it certainly doesn’t shy away from the label or demand corrections when described as such. For better or worse, sumo represents Japan in a way that even wildly popular sports like baseball or soccer never can. So what does it say about our country when the national sport clearly doesn’t value women as equals? Is that the image we are happy to portray when the planet’s attention will be focused on us for the 2019 Rugby World Cup and 2020 Olympic Games? The reality is the world is changing. Bastions of male privilege are being dragged into the modern world and things that were acceptable just five or 10 years ago no longer are. Sumo’s ban on women is increasingly indefensible. The JSA should use the latest incidents as a spur to enact positive change and show that they value all people regardless of gender. As Marcus Aurelius said: “Who is afraid of change? What can exist without it? What’s closer to nature’s heart? Can you take a hot bath and leave the firewood as it was? Eat food without transforming it? Can any vital process take place without something being changed?